Keeping iPad handwritten notes and sketches quick – sharable! We all had a good chuckle at ourselves this last weekend. One of the team members got up to find a napkin to jot a note down on… once they found a pen in their bag. Why not use the iPad they had the napkin sitting on? “Because it is a simple note, not notes for a meeting” he said. This brought about a conversation about over complicating things when simple is best. We have highly capable apps for typing notes on that share to our many desktop computers, we have handwritting notes apps that allow all kinds of edits. What is needed is a place to jot a speedy note while sitting in a lobby or on a call. 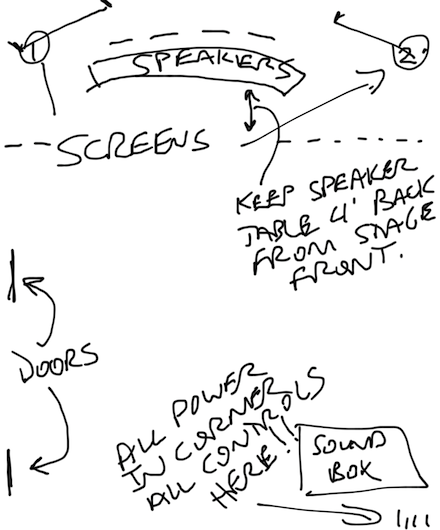 Or draw a sketch for things like table/chair placement at an event. Sharing? Yes, this is important too… but it has to be easy. No need to insert pictures, add our voice or correct our scribbles… just our handwriting as we did it. Enter an old but forgotten friend, Penultimate. The app has gotten a few more features since the last time we reviewed it here but it still hasn’t gotten over complicated. 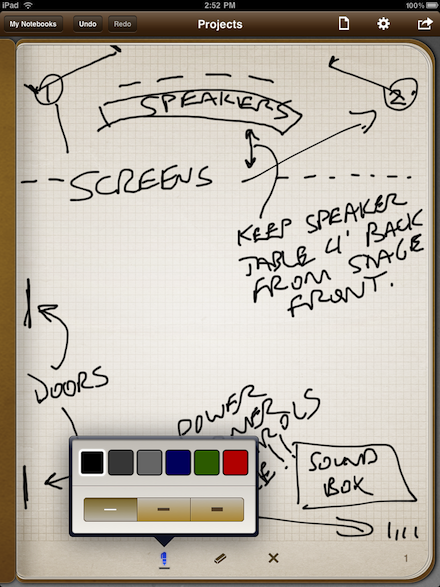 You can set up different notebooks for projects or type of scribbles. You can choose to use graph, lines or blank ‘paper’, as well pen thickness and colors. You have an eraser and you can erase the whole page in one button push. And, you can share a single page or a whole notebook through email. A nice use of notes in Penultimate is sending them directly to our Evernote email so they appear in our Evernote app too. Simple sketches can stay simple and quick. An added feature, you have a record of your handwritten sketch so you know what was handed out, unlike the lobby napkin.